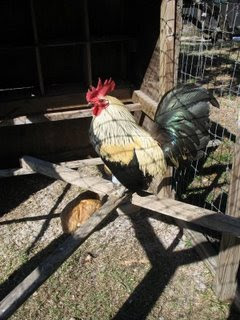 This Rooster is not Red, but then again, neither is the drink. I don't know how Emeril got his so red. When I added the orange juice concentrate, it really washed out the color. 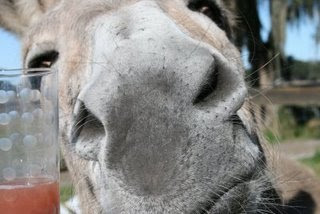 The drink is very tasty and nice to have in the freezer for when cumpny comes a callin'. Combine all of the ingredients in a large plastic container and freeze for several hours. It will not freeze solid and ends up like a slushy. Sometimes I use a combination of cranberry and pomegranate---does that make it more healthy? I wonder.... Sidenote: Kelly and David like a good vodka called Svedka, but love Monopolowa even more. 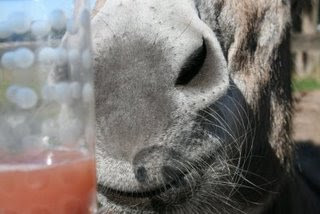 Snuffy the donkey is pondering if the glass is half empty or half full! Guess it really doesn't matter if you have two quarts. 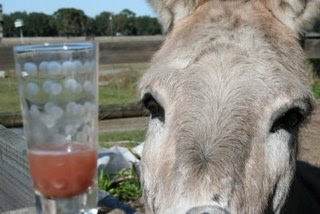 This is an excellent drink that has become popular with several of our pasture friends. There is another called something like LimonChello and has been refered to as "high octane fuel" by our ex-drag racer friend. When we import the secret ingredient from out of state, then it has to be re-classified as explosive. to enhance wisdom and imagination, emotions, calm the anger. without the use of a filament or glass bulb.